Tennis elbow exercises are an essential part of the chiropractic care. Tennis elbow exercises and stretching the wrist extensor muscles are the key. An ice massage is the best painkiller; anti inflammatory drugs have no place in the treatment of lateral epicondylitis, as it's known in orthopaedic jargon. Give it a mysterious name and you can charge twice as much. These exercises are for the right arm. Here is the first. Stretch out your right arm so the elbow is straight. With your left hand, grasp the middle finger, and perhaps the ring also on the other. Test it to get maximum flexibility in the forearm. Now pull on them, not so they pop out of their sockets, but if you have lateral epicondylitis you will almost certainly feel a good stretch in the extensor muscles on the outside of the elbow. Don't jerk, just a nice slow gentle stretch of the muscles in the elbow. The second one's a bit more tricky. 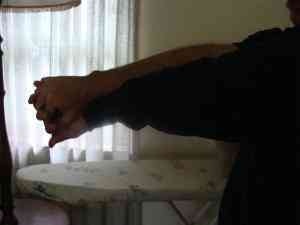 Pronate your right arm, turn it inwards, as far as you can, with the elbow straight. Now reach over with your left hand, and interlace the fingers. 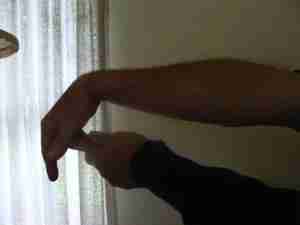 Now extend the left wrist, using the muscles in your left limb, to stretch the muscles in the right forearm. Get it? Clear as mud? I'll try and do a video of these in the next couple weeks. Tennis elbow exercises are an essential part of the chiropractic regimen. It's not a bad idea to do this to both arms, but if your right arm hurts, it might give pain when using it to stretch the left wrist extensors. Gently does it. Place your right hand behind your back, elbow straight as you can for tennis elbow exercise 3. Make a fist. Now grasp your right fist with your left hand and flex the right wrist using your left hand. You should feel a stretch in the right elbow muscles. This exercise is quite different. The first three are stretch exercises for the extensor tendons in the right arm. As in exercise 2, pronate your LEFT arm, elbow straight, and cross over with the right hand. Interlace the fingers. 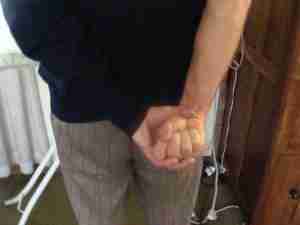 Now extend the RIGHT wrist, using the right extensor muscles. You will probably feel a little pain in the right elbow area. Not too hard... or you'll strain the muscles in your right arm. A nice little benefit of this exercise, is that you are stretching the tennis elbow muscles in the LEFT arm at the same time. Lateral epicondylitis does respond to ice treatment even though there are questions as to whether it's an inflammatory condition; it's the tennis elbow exercises that really help. If you are a sports person, or regularly have acute pains of one sort or another, keep an ice cup in the freezer. Here you can see a patient icing his knee. 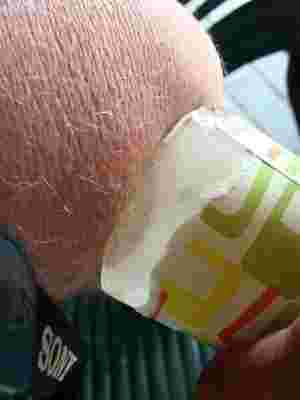 Do the same on the elbow, ice massaging the muscles and their origin on the lateral epicondyle until it's very cold. Now warm, say in the bath or shower. Repeat several times, alternating cold and hot. Then when it's warm again do your stretches. CORTISONE TREATMENT FOR TENNIS ELBOW? 64 people suffering from Tennis Elbow (Lateral Epicondylosis) were divided into two groups, one of which was given a cortisone injection, the other a placebo treatment. They repeated these tests one and six months after the injections. The research was conducted using the "gold-standard" double-blind RCT (Randomized Clinical Trial). Neither the researchers nor the patients knew whether they were receiving the real treatment or the placebo; hence "double-blind". That arm pain quick DASH test is easy to do at home to see how badly you are in need of exercises. There would be no difference in disability, pain, and grip strength one and six months after steroid and lidocaine shot combined, compared with lidocaine shot alone (the placebo). One month after injection DASH scores averaged 24 versus 27 points (cortisone vs placebo), pain 3.7 versus 4.3 cm, and grip strength 83% versus 87%. Six months, DASH scores averaged 18 versus 13 points, pain 2.4 versus 1.7 cm, and grip strength 98% versus 97%. Steroid injections did not affect the apparently self-limiting course of tennis elbow. The disability associated with tennis elbow correlated with depression and ineffective coping skills. At one month, the cortisone group had significantly less pain, but after six months, the cortisone group lagged significantly behind the untreated group. The cortisone group had more pain (4.3 -vs- 3.7) than the placebo group. Chiropractic help is a frequent business in any sports oriented practice; and tennis elbow exercises are often in demand. The technical name for tennis elbow used to be Lateral EpicondylITIS; tennis elbow exercises, ice and adjustments of the radial head are what help; and of course a thorough assessment of the lower neck. 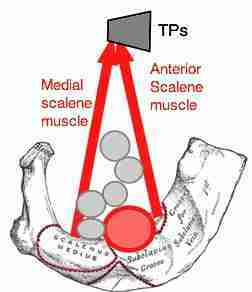 Lower cervical facet anatomy will give you a clearer understanding. 'ITIS' means inflammation. However even current medical thinking is that it is really Lateral EpicondylOSIS. 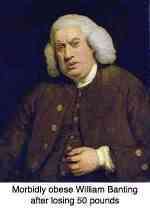 A condition of, rather than an inflammation of the elbow. So it comes as no surprise that in the long term there was no scientific benefit from corticosteriod injections for tennis elbow. In fact, the steroid injection group was significantly worse off than the placebo group in the long term; the drug weakens the tendon and it may even rupture completely. Chiropractic help tennis elbow treatment is based rather on ice, stretching, active tennis elbow exercises, various techniques such as Active Release Therapy, and of course seeking out any subluxations in the lower neck, or of the first rib. The "brachial plexus" of nerves to the arm pass through the inter scalene triangle, bounded by two scalene muscles and the first rib, sometimes accompanied by cervical ribs. An irritation of the nerves or artery in the triangle may cause what is known as a THORACIC OUTLET SYNDROME frequently with shoulder or elbow pain, or carpal tunnel syndrome, or tingling in the arms and hands. The correction of the first rib fixation needs to be done by your chiropractor, but you can help yourself by doing these exercises. Adson's test is used to determine if the artery is affected; the pulse in the wrist is reduced.